Hail, Caesar!, the Coen brothers’ madcap musical tribute to one day in the life of “fixer” Eddie Mannix in the last days of the Hollywood studio system, hits theaters this Friday, February 5. 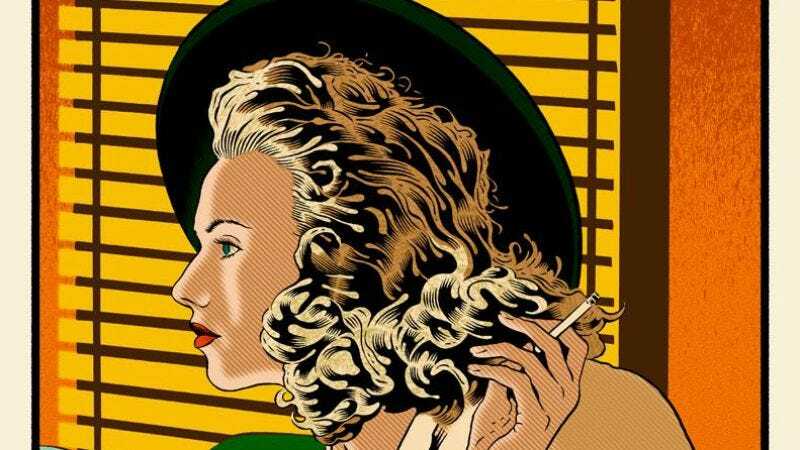 Trailers for the film have promised plenty of Old Hollywood razzle-dazzle punctuated with the Coen’s signature wit, a vibrant combination reflected in L.A.-based, pop-culture oriented art gallery Hero Complex’s upcoming series of pop-art prints inspired by the movie. The A.V. Cub is please to exclusively premiere the first in this series of prints, “The Starlet,” below; created by veteran gig poster designer Chuck Sperry, the print depicts brassy Capitol Pictures starlet DeeAnna Moran—played by Scarlett Johansson in the movie—in her femme fatale mode. The print, which was produced in a limited edition of 150, measures 16.75” x 35,” is printed on cream paper, is signed and numbered, and can be purchased for $60 on the Hero Complex website.